Cat Chat With Caren And Cody: Winners! Fancy Feast Mug Give-Away!! Winners! 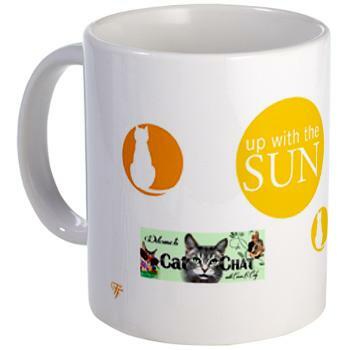 Fancy Feast Mug Give-Away!! Yay !!!! For all winners ! Thank you Ann!! CONCATULATIONS!!!! Thanks so much for entering! woo hoo! what a great way to start the day! Thanks! We are thrilled, Mommy is going to enjoy drinking her HOT stuff out of this mug so much. Thanks!!!!!!!! Awwww Fenris and family that makes me feel so happy!! You are most welcome! Thank you for entering!! That sure is a wonderful bunch of winners! you are most welcome! Concatulations!! OMICATS!!!! MAMA WON!!!! We just got out furry little faces out of her way long enough for her to see this!!!! She is still on a caffeine high from earlier..oh boy..now she will drink more coffee than ever...oh boy!! Thank you Auntie Caren!!! We can't wait to see Cody's face every morning. Hope you had a Meowy CHRISTmas and that you are all in safe and sound in this Michigan SNOW STORM!!!!! XOXOXO Rosie and Topaz!!! thank you so much Colehauscats! How exciting!! Thank you for hosting the contest and we look forward to receiving our mug so we can share a cup of coffee with you in the morning! You are welcome Deb! Thanks so much for entering! Maybe one day I will join you! :) Congratulations! Just stopped by to say we hope you had a wonderful Christmas, and to wish you a fabulous 2013! That is a nice looking mug. ConCATulations to all the winners ! Lovely mug. Congratulations to the winners. Wow, that is a lot of winners and sure glad we are one of them. That will be fun to have a mug with Cody's picture on it. Thanks for having this drawing. Hope all of you have a great day. You are welcome Marg and CONCATULATIONS! You have a great day as well! Congrats to the winners. What a great prize! Cody,your sweet face on the mug...that is the best. Thanks for the cool mug, Caren & Cody!!! When it comes, would you like us to return the box to you? With a certain orange kitten inside??? MOL!!!! You are sooo welcome Katie!! You know what? Of course you can send Waffles Too in the box to us, but...I have a feeling you would all miss him terribly! Even YOU Katie! MOL!! Mowzers! Concatulations to all the winners!!! very nice mug and pawsome photo of you Cody! We laffed at Katie's comment. She's really desperate, isn't she?